The latest batch of free content for PSN users includes the poorly spelled Genesis classic Comix Zone. I still have fond memories of Comix Zone for the Sega Genesis. Sure the page-hopping brawler made the jump from frustrating to ridiculously difficult somewhere around the beginning of level 2 and lasted about as long as an episode of Coronation Street, but the game's concept and punishing combat was just downright awesome. The surprisingly good soundtrack that shipped with new copies of the game, also helped. 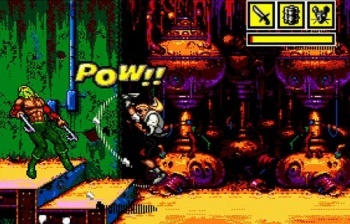 PSN Plus subscribers will be getting Comix Zone (sadly sans the 90s's grunge soundtrack) for free on August 9th along with an add-on bundle for Crash Commando, a free trial of FarCry2 and various other assorted themes and knickknacks. The game will be exclusive to PSN Plus users for an initial period, but judging by other titles released on the service, slovenly non-Plus customers will be able to download a copy around a month after its release. Take heed, however. Comix Zone will be replacing the current free title, Golden Axe. So if you haven't snagged a copy of that one yet, make sure you do before it disappears on August 9th.